The World Organization of the Scout Movement (WOSM) is the supranational organization which governs most national Scout Movements, with 28 million members. It is the counterpart of the World Association of Girl Guides and Girl Scouts (WAGGGS). The World Scout Conference is the governing body and meets every three years, preceded by the World Scout Youth Forum. The World Scout Conference is the general assembly of Scouting and is composed of six delegates from each of the member Scout associations. If a country has more than one association, the associations form a federation for coordination and world representation. The basis for recognition and membership in the World Scout Conference includes adherence to the aims and principles of the World Organization of the Scout Movement and independence from political involvement on the part of each member association. At the World Scout Conference basic cooperative efforts are agreed upon and a plan of mutual coordination is adopted. The last World Scout Conference was held in 2005 in Hammamet, Tunisia. The next conference will be held in 2008 in Korea. The World Scout Committee is the chief executive body of the World Scout Conference and is composed of elected volunteers. The World Scout Committee represents World Scout Conference between the meetings of the full conference. World Scout Committee members are elected at the World Scout Conference for a term of six years. The members are elected without regard to their nationality. The Bronze Wolf is the only distinction awarded by WOSM, awarded by the World Scout Committee for exceptional services to world Scouting. It was first awarded to Robert Baden-Powell, 1st Baron Baden-Powell by a unanimous decision of the then-International Committee on the day of the institution of the Bronze Wolf in Stockholm in 1935. The World Scout Bureau (formerly the International Bureau) is the secretariat that carries out the instructions of the World Scout Conference and the World Scout Committee. The World Scout Bureau is administered by the secretary general, who is supported by a small staff of technical resource personnel. The bureau staff helps associations improve and broaden their Scouting by training professionals and volunteers, establishing finance policies and money-raising techniques, improving community facilities and procedures, and assisting in marshaling the national resources of each country behind Scouting. The staff also helps arrange global events such as the World Scout Jamborees, encourages regional events, and acts as a liaison between the Scouting movement and other international organizations. A major effort in the emerging nations is the extension of the universal Good Turn into an organization wide effort for community development. European Region: Geneva, Switzerland; Brussels, Belgium and Belgrade, Serbia. Africa Region: Nairobi, Kenya; Cape Town, South Africa; and Dakar, Senegal. Asia-Pacific Region: Makati City, Philippines; Australia; and Tokyo, Japan. Eurasian Region: Gurzuf near Yalta, Ukraine and Moscow, Russia. The World Organization of the Scout Movement is associated with Kandersteg International Scout Centre in Kandersteg, Switzerland which is operated by a separate not-for-profit corporation. The World Scout Jamboree is held roughly every four years under the auspices of the WOSM, with members of WAGGGS also invited. WOSM also organises the World Scout Moot, a Jamboree for 17-26 year olds, and has organised the World Scout Indaba, a gathering for Scout leaders. The World Scout Foundation is a perpetual fund governed by a separate Board of Governors and supported by donations for the development of Scouting programs throughout the world. The WOSM is the non-governmental organization (NGO), that represents the Scouting movement at the United Nations The WOSM and WAGGGS both have General Consultative Status with the Economic and Social Council of the United Nations. 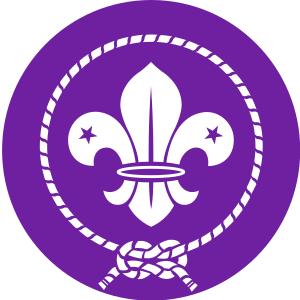 The WOSM membership badge is a purple, circular badge with a fleur-de-lis in the center, surrounded by a piece of rope tied with a reef knot (also called a square knot). The fleur-de-lis is an ancient symbol, originally used by Baden-Powell for the enlisted scouts of the British Army and subsequently adopted and modified for Scouting. The arrowhead represents the North point on a compass, and is intended to point Scouts on the path to service and unity. The three points on the fleur-de-lis represent the three duties, to God, self and others. The two five-point stars stand for truth and knowledge, with the ten points representing the ten points of the Scout Law (see below). The bond at the base of the fleur-de-lis shows the family of Scouting. The encircling rope symbolises the unity and family of the World Scout Movement. Historically in the United States, the Boy Scouts of America (BSA) used this symbol as an award called the World Crest. It was given to Scouts and Scouters who had participated in an international Scouting event, such as a World Jamboree. In 1991, the BSA made it part of the uniform for all Scouts. The needs of Scout youth in unusual situations has created some interesting permutations, answerable directly to the World Scout Bureau. For years there was an active Boy Scouts of the United Nations with several troops at Parkway Village in New York City, with but 14 members in 1959. Also directly registered to the World Bureau were the 900 member Boy Scouts of the Panama Canal Zone, as well as 84 Scouts of the European Coal and Steel Community, an early precursor to the European Union. WorldInfo: a monthly circular distributed in electronic format with the help of Scoutnet. This page was last edited on 21 October 2016, at 00:17.